The Startup India Yatra campaign was conducted at Jawaharlal Nehru College at Pasighat in Eastern Arunachal Pradesh on Monday. It needs mention that Startup India is an initiative of the Central Government which was first launched by Prime Minister Narendra Modi during his address from the Red fort in New Delhi on August 15, last year. It aims at working towards innovation and development or improvement of products, among others. Aruanchal Pradesh Chief Minister Pema Khandu along with the officials launched the Startup India campaign in Itanagar on February 7 last. It is a flagship scheme initiated by Government of India with an objective to build a strong ecosystem that is conducive for the growth of startup businesses, announced by Prime Minister Narendra Modi in August 2015. 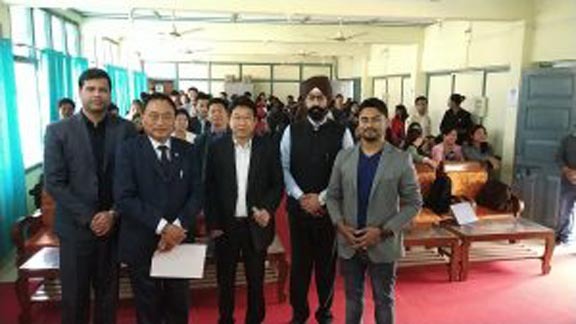 Attending the programme, East Arunachal MP (Lok Sabha) Ninong Ering said Arunachal Chief Minister Pema Khandu was facilitating the campaign in the state in order to give entrepreneurship avenues to the unemployed youths, who desire to excel in life by taking advantage of the government sponsored schemes. MP Ering said that he was helping the Startup India team to reach out to the every district of the frontier state as the needy entrepreneurs can avail its maximum benefits. Startup India official Guneet Malik, who is supervising the campaign in the state, said the campaign aims to catalyze the vast entrepreneurial talent present in the small cities of country and build a strong ecosystem that is conducive for the growth of startup businesses. Among others, Jawaharlal Nehru College Principal Dr Milorai Modi, faculty members of the college and local entrepreneurs and students attended the programme.